This summer we asked you to weigh in on several oil and gas leasing actions that would degrade wildlife habitat and other special landscapes in Wyoming. You responded by submitting comments and letting officials know that some places just aren’t right for development. Thank you! Because of your quick action, we have a few successes to report. In western states, U.S. Bureau of Land Management lease sales are growing exponentially in size. 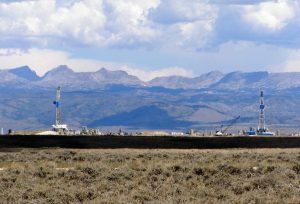 This year, the number of federal acres offered for oil and gas development in Wyoming ballooned from 170,509 in the first quarter to a whopping 700,000 acres in the fourth. “I’ve never seen a lease sale in Wyoming of that size, ever. Seems like it’s a firesale,” Outdoor Council Senior Conservation Advocate Dan Heilig said. Following the president’s “energy dominance” directive, the BLM is also offering shorter timeframes for the public to review and respond to lease sales, while also ignoring its previous commitments to not lease in areas undergoing planning revisions. This has led to leases being sold in areas that have less than adequate protection. And the public isn’t even getting a fair return. Many lease parcels offered in these sensitive areas are selling for the federal minimum of $2 per acre, whereas parcels in developed areas “in play” can go for $3,200 per acre. The sale of a lease parcel conveys a legal right to develop. Because neither the state nor the federal government is carefully analyzing where it sells, or allows citizens time to comment, the public stands to lose. Back in 2012, citizens rallied to help purchase and retire nearly 60,000 acres of oil and gas leases in the Upper Hoback of the Wyoming Range. These were leases originally bought on the cheap, which citizens then spent $8.75 million to purchase and retire. Today’s wave of federal leasing poses similarly costly threats far into the future, whether leases must be bought out in some places, or development robs the public of productive wildlife habitat and outdoor and tourism dollars. In the July Wyoming state lease sale your emails, letters, and phone calls to state officials helped result in a handful of lease parcels being pulled — one at the foot of Boar’s Tusk. This is fantastic news. Unfortunately, the State Board of Land Commissioners approved the sale of nearly two dozen other parcels that we and many partners opposed. This shortsighted lease sale not only threatens critical wildlife habitat and rare cultural resources in the Red Desert, it also highlights several deficiencies in the state leasing process. First, the state’s public notice for oil and gas lease sales is woefully inadequate. The state allowed only 30 days for the public to review 187 proposed leases statewide. Second, although the public may access and comment on proposed lease sales, the state provides no formal avenue to do so. With your help we will continue to push officials to resolve these deficiencies. And, recognizing that Wyoming’s constitution prioritizes uses of state lands to generate revenue for Wyoming schools, we’ll also keep touting a better alternative to leasing special state landscapes for energy development: exchanging those lands for BLM parcels better suited to industrial development. The state’s July lease sale precedes two federal oil and gas lease sales that also include parcels in sensitive areas, such as Greater sage-grouse core areas, crucial winter range, and the Red Desert to Hoback mule deer migration corridor. So far, the Wyoming Game and Fish Department has been reluctant to weigh in on recent federal leasing actions with its own expertise. We continue to urge the state to guide federal agencies on matters best understood by expert biologists citing the best available science. The state has so far failed to note that federal stipulations attached to oil and gas lease parcels don’t take into consideration 15 years of published research by wildlife biologist Hall Sawyer. The research shows such stipulations do not adequately protect wildlife from oil and gas development. Rather than keeping its foot on the gas pedal, the BLM needs to hit the brakes on oil and gas leasing in and near migration corridors. The agency needs to take time to adhere to the best available science and to amend existing stipulations to ensure protections actually work as intended. This year we also asked you to submit comments on BLM oil and gas lease sales, and many of you responded. Thanks to your advocacy and the urging of Gov. Matt Mead, the BLM agreed to defer the sale of nearly 5,000 surface acres of federal lease parcels that intersect with the Red Desert to Hoback mule deer migration corridor. This is a good start to defending this corridor, and it showed the BLM that Wyoming citizens are resolute in protecting the state’s critical wildlife habitat. Thank you for staying engaged and helping us keep the promise that we owe to future generations. — Read the Wyoming BLM Third Quarter oil and gas lease sale protest letter filed (August 11, 2018) by Wyoming Outdoor Council, National Audubon Society, The Wilderness Society, and Wyoming Wilderness Association.